When I saw the trailer for Let’s Be Cops I genuinely enjoyed it. It not only looked funny, but stars both Jake Johnson and Damon Wayans Jr, who are also in the Fox sitcom New Girl (which is funny), whom I assume since they knew each other already, that that chemistry would transfer to the movie. And it doesn’t. Not at all. Which isn’t to say that there aren’t any funny moments, but considering how many jokes there are in this movie, the likelihood of a few hitting their marks is high. Mel Brooks is one of my favorite comedy directors, and–particularly in his earlier work, such as Young Frankenstein, Blazing Saddles and High Anxiety–often revolved around a normal person put in situations that a way beyond their control and things are actually played relatively straight. Here there are too many attempts to be funny, and more often than not, nothing is less funny that someone trying to be funny. Then there’s the logic problem: Despite Ryan (Jake Johnson) and Justin (Damon Wayans Jr) having no real-world experience being policemen there’s no sense of danger about anything, despite the two putting themselves in threatening situations A LOT. In most movies you understand that the leads aren’t going to die, but when they’re in danger you’re supposed to at least feel that there’s a chance that they will. Then there’s the logic, or should I say lack of logic, of the story. Two guys disguise as policemen–did I meant I mention that they have not an iota of practical experience–and walk around with guns that don’t work, doing all sorts of things policemen do (in television shows) and apparently no one notices this, not even other cops (who’d you think that there’ll at least be a chance that they could recognize their own). Then there’s the fact that virtually everyone has an cell phone (‘virtually’ because I don’t, so I shouldn’t necessarily assume that everyone else does) has a cell phone which should be filming the antics of these two idiots. Which in reality happens a lot. Another thing is that Ryan and Justin are apparently the only two policemen in the entire city of Los Angeles, because virtually no others answers a call. It’s also important to keep in mind that Justin knows nothing about being a policeman, and what Ryan knows he’s picked up on YouTube (speak of the devil), so this movie has laid the groundwork for some really dark comedy. 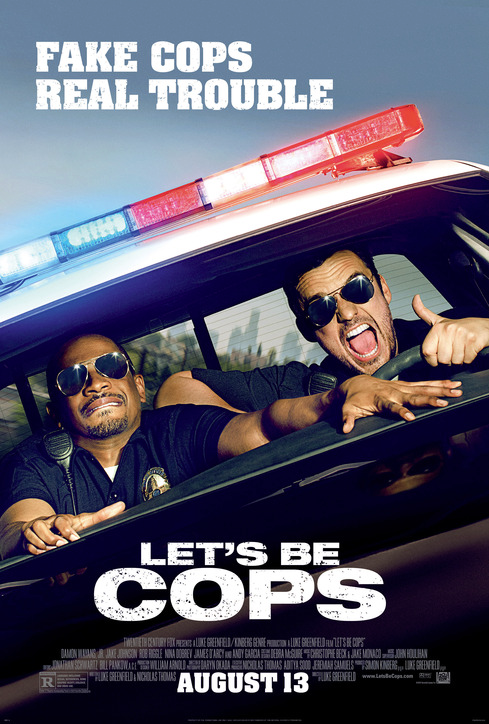 An opportunity that’s wasted, because Let’s Be Cops instead aims for fluffiness and silliness (and doesn’t particularly succeed at those goals, either). Posted in 20th Century Fox, actors, buddy comedy, comedy, Fox, Movies, review, TV.Tagged Damon Wayans Jr., Jake Johnson, Los Angeles, Mel Brooks, New Girl, YouTube.